Classroom teachers spent an average of $468 out of pocket on classroom supplies and equipment in the last year — amounting to nearly 1 percent of an average teacher's salary in the United States. Nearly eight in 10 teachers — 77 percent — spent "at least" $200, with some as high as $5,000, according to the latest results of an annual survey from SheerID and Agile Education Marketing. The results were based on responses from 674 educators. Extrapolating those figures out, in public K–12 schools alone, teachers spent a total of nearly $1.5 billion last year. As high as that figure sounds though, it's actually down slightly from previous years — $20 less than in 2016's survey and more than $40 down from 2014. "Though we've seen average spending slightly decrease year-over-year, it's clear that teachers are still spending a significant amount of their personal money on funding classroom supplies and materials almost every month," said Jenny Schumacher, vice president of sales and marketing for Agile Education Marketing, in a prepared statement. "Retailers should understand that back-to-school shopping isn't the only time teachers are looking for discounted pricing, and that offering deals year-around will only increase loyalty to their brands." 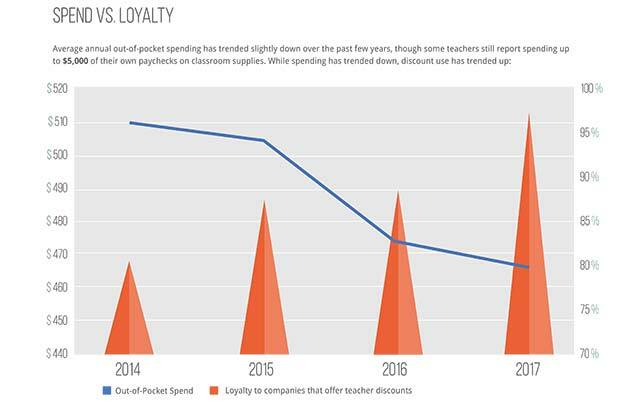 The report noted that as individual teacher spending declined slightly, teachers have begun giving their loyalty to online marketplaces that offer teacher discounts. Source: Infographic accompanying the release of the 2017 teacher spending survey results from SheerID and Agile Education Marketing. According to the report: "Mirroring their affinity toward discount pricing, teachers noted that they are 96 percent more likely to purchase from a company that offers a teacher discount online than one that doesn't. However, the size of the discount continues to matter, and it is growing in importance. Eighty-three percent of this year's respondents said that a discount of 25 percent will get their attention, a 5 percent increase from 2016. However, just 39 percent of these teachers are currently enrolled in discount programs, down a full 20 percent from the previous year. This could signal the need for simpler redemption methods than requiring program membership." The top uses of teacher discounts included office supplies, computers, software, entertainment, travel, restaurants and apparel. Additional details about the survey, including an infographic with further results, are available at sheerid.com/blog.